Idiopathic pulmonary fibrosis ( Idiopathic pulmonary fibrosis IPF) is described as a progressive, irreversible chronic lung disease. It usually presents with progressive dyspnea, reduced lung volumes, bilateral lower lobe reticular opacities, and a usual interstial pneumonia UIP patter on histology. There is no definitive treatment and median survival is approximately 3 years. , The natural history of IPF was thought to be a steady decline in lung function but recent literature has demonstrated that the decline in lung function may be more stepwise and often accompanied by acute exacerbations hastening the fibrosing process and ultimately resulting in death. There is no consensus on an established definition of acute exacerbation of IPF (AE-IPF). Most of the studies defined AE-IPF as a combination of symptoms, radiographic findings, blood gas parameters, and an exclusion of any alternative causes of this clinical scenario. AE-IPF was described as a separate entity in 1993 by Kondoh and colleagues;  however, it was in 2007 that Collard et al. 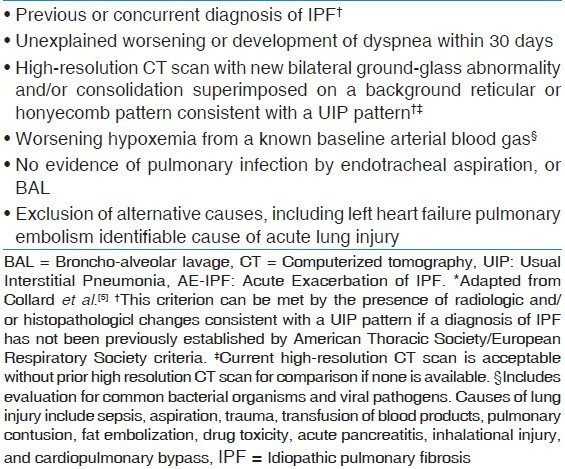 proposed a definition describing AE-IPF as "an unexplained new or worsening shortness of breath within the past 30 days, along with new lung infiltrates and exclusion of any reversible and recognizable etiology causing lung injury"  [Table 1]. Understanding about pathogenesis of development AE-IPF has been enhanced with study of biomarkers and better imaging modalities. Most of the times, the clinician is faced with a patient with known IPF who has a rapid deterioration without an obvious cause. Diagnosing the condition in time is a challenge. The diagnostic dilemma is not only differentiating this entity from acute lung injury and acute respiratory distress syndrome (ARDS) but also ruling out worsening of coexisting entities such as pulmonary hypertension and heart failure. Currently, there is no definitive long-term treatment proven effective for IPF and there is even less data on prevention and treatment of AE-IPF. There have been anecdotal reports suggesting that broncho-alveolar lavage (BAL) and interferon therapy may have played a role as being the inciting factor for AE-IPF but the exact triggers are unknown. , There is also evidence in literature of AE-IPF developing after lung biopsy. Kondoh et al. showed that the incidence of post-operative exacerbation was 2.1% (5/236 patients) after surgical lung biopsy. Similarly, surgical lung resection has also been identified as a precipitating factor for AE-IPF; , however, surgical approaches such as conventional thoracotomy, muscle sparing thoracotomy, or video-assisted thoracoscopic surgery have not been reported to influence the occurrence of post-operative AE-IPF. Sakamoto and colleagues reported that 3 of 39 patients with IPF developed AE-IPF after surgical resection secondary to lung cancer (2 lobectomy, 1 biopsy). All three patients died of respiratory failure within 12-82 days after the onset of AE-IPF. They postulated that this was related to oxygen supplementation at a high concentration and/or prolonged mechanical ventilation. Gastro-esophageal reflux has been viewed with much interest as one possible causes of AE-IPF. , Lee et al. compared BAL pepsin level of 24 AE-IPF cases and 30 stable IPF controls, and found that pepsin level was an indicator of acute exacerbation status (P0 = 0.04). However, this difference was driven by only a subgroup of eight patients (33%) with pepsin levels > 70 ng/ml, providing modest evidence that occult aspiration is associated with AE-IPF. In the literature certain risk factors have shown to be associated with high mortality in patients who develop AE-IPF. These factors range from molecular level to gross clinical findings [Table 4]. As the knowledge base about this new entity expands, a clear relationship between different parameters which define its morbidity and mortality will become evident. Recent research on gene expression has remarkably enhanced our understanding about AE-IPF pathogenesis. Using gene expression microarray, Konishi et al. studied 23 stable IPF patients and eight patients with AE-IPF. Gene expression of CCNA2 and α-defensins were up-regulated in AE-IPF patients when compared with IPF patients and their expression was localized to the alveolar epithelium. This suggests a central role of the pulmonary epithelium in AE-IPF and possible role of α-defensins as a biomarker. Similarly, a biomarker study compared patients with stable IPF (n = 20), AE-IPF (n = 47), and acute lung injury (n = 20) and also biomarkers of type I alveolar epithelial cell injury/proliferation [receptor for advanced glycation end products (RAGE)] versus markers of type II alveolar epithelial cell injury (KL-6 and SP-D). They found that KL-6 and SP-D levels were significantly elevated (P = 0.0003 and 0.01, respectively) in AE-IPF compared with stable IPF. RAGE levels were not different between groups (P = 0.79). Levels of Von-willibrand factor vWF and interleukin (IL-6), total protein C, thrombomodulin, and plasminogen activator inhibitor-1PAI-1 levels were significantly higher in AE-IPF compared with stable IPF. In comparison to acute lung injury, AE-IPF demonstrated higher levels of Krebs von den Lungen-6 (KL-6) and surfactant protein D (SP-D) and lower levels of RAGE, vWF, and IL-6. The study highlighted the fact that the AE-IPF is characterized by increased type II alveolar epithelial cell injury and/or proliferation, endothelial cell injury, and coagulation abnormalities which is consistent with the hypothesis that AE-IPF represents the acceleration of the underlying primary disorder. AE-IPF is a diagnosis of exclusion. An integrated approach is imperative. The main theme is to rule out any antecedent reversible factors that may have caused the decompensation. A patient with IPF who is in acute exacerbation presents with pronounced dyspnea, tachycardia, and hypoxemia when compared with baseline. Worsening hypoxemia in a patient diagnosed with IPF could be secondary to pneumonia, pulmonary embolism and heart failure [Table 1]. The physician should focus on current smoking status, use of prescribed and non-prescribed medications, immunosuppression, and undiagnosed reflux disease. Increases in white blood cell count, C-reactive protein, and lactate dehydrogenase can be demonstrated in AE-IPF but these are non-specific and can be elevated in other entities such as Acute interstial pneumonitis AIP. , An Electro cardio gram EKG should be assessed for any arrhythmias and an arterial blood gas should be obtained to not only ascertain the degree of hypoxemia and hypercapnea but also to anticipate any need for mechanical ventilation. Neutrophil elastase, KL-6, lactate dehydrogenase levels, and several other serum markers have been studied for AE-IPF. Tajima et al. reported significantly higher serum levels of soluble ST2 protein in patients with AE-IPF when compared with stable IPF group whereas Moeller and colleagues  reported that levels of circulating fibrocytes were elevated in patients with stable IPF which were further increased in AE-IPF patients. α-Defensin and ST-2 protein levels in serum have been shown to be significantly high in patient with AE-IPF. , Similarly, Kurosu and colleagues found that antibody to annexin-1 was detected in 47% of the sera and 53% of the BAL fluid from patients with AE-IPF. Currently, there is not enough data to justify widespread use of these tests. Presently AE-IPF lacks an effective treatment. There is a dearth of evidence-based management strategies available at this time. This is in part due to a lack of a consistent definition for describing AE-IPF and also due to the lack of randomized controlled trials evaluating different treatment approaches. In view of the unpredictable onset and rapid decline in patients with AE-IPF, it is extremely difficult to assess the true potential of any treatment. Modalities studied and used recently for AE-IPF have been extrapolated from those used to treat IPF and ARDS as AE-IPF combines the clinico-pathologic feature of these two diseases. The available treatment includes pharmacological and non-pharmacological options. Frequently, aggressive therapy involving multiple modalities is used to deal with AE-IPF. Much research is currently focused on finding factors which predict the onset of this devastating complication as it might help in its prevention. Patients developing this complication have complex management requirements which are usually best met in an ICU setting. There is a move worldwide to develop specialized centers where multidisciplinary coordinated care involving pulmonary, critical care, cardiothoracic surgery, and lung transplantation teams are readily available for managing IPF and AE-IPF. Even though a Cochrane review found that there is no beneficial effect of corticosteroids in chronic non-exacerbated IPF, , studies were carried out to see the effect of steroids on AE-IPF. These studies were based on the fact that there is an increased inflammatory response in patients with AE-IPF, which might respond to steroid therapy. A study  carried out in the early 1990s showed some improvement with corticosteroid therapy, but subsequent studies have shown a high mortality rate despite their use. , Most investigators have used pulse corticosteroid therapy at a dose of 500 to 1,000 mg of methylprednisolone per day for 3 days (the same dose regimen used to treat idiopathic ARDS). , Recent studies , have used lower doses of steroids over a protracted period of time. The real potential of this approaches needs to be further analyzed in larger studies. The role of Cyclosporine A used at a dose of 1.0 to 2.0 mg/kg/day in combination with corticosteroids has been investigated in a small, uncontrolled study to treat AE-IPF. This study did show a trend towards prolonged survival in patients with AE-IPF. Data supporting use of Cyclophosphamide to treat AE-IPF is still lacking. Currently, there is no strong evidence favoring use of Cyclosporine A or Cyclophosphamide in patients with AE-IPF. This novel antifibrotic compound is generating significant interest as a potential therapeutic agent for stable IPF. In a double-blinded, randomized controlled trial, patients who received Pirfenidone with IPF showed a reduced incidence of development of AE-IPF (placebo group, 13.9%; pirfenidone group, 0%). Unfortunately, similar results were not reproduced in a recent study carried out by Taniguchi et al. Thus the efficacy of Pirfenidone, both to prevent and treat AE-IPF, is still unknown. Since AE-IPF causes alveolar injury that leads to a prothrombotic effect. anticoagulation can prevent escalation of vascular injury  Anticoagulating agent with prednisolone has been used as a treatment modality in a study on patients with IPF hospitalized for worsening disease compared with prednisolone alone with improved survival. The mortality associated with acute exacerbations of IPF in the anticoagulant group was significantly reduced when compared with the non-anticoagulant group (18% vs. 71%, respectively; P = 0.008). This study was small, non-blinded, and lacked a placebo arm thereby decreasing the validity of the result. The distinct advantage that non-invasive ventilation (NIV) can provide is avoidance of mechanical ventilation and its associated risks (aspiration, ventilator-associated pneumonia, and ventilator-associated injury). Unfortunately, the data is still lacking on short or long-term effects of NIV in patients with AE-IPF. The problem is that in most patients the excessive work of breathing associated with AE-IPF cannot be managed effectively by NIV for prolonged periods. Current data does not support use of NIV in patients who are suspected to have AE-IPF unless a rapidly reversible cause is found. Lung transplantation is the only therapy which has been proven to increase the long-term survival of patients with AE-IPF. , Patients with AE-IPF who are transplant candidates should be considered for transfer to a transplant center to shorten the waiting time until transplantation, which can frequently be more than patient's life expectancy. In conclusion AE-IPF is a potentially lethal complication of IPF. It is a disease of exclusion for which a diagnostic algorithm has been proposed. It is usually treated with corticosteroids with the possible addition of other immunosuppressive agents despite a lack of clear data to suggest any therapy is beneficial. Because mechanical ventilation when needed is often futile it should be used as a bridge to lung transplantation when AE-IPF is the sole cause of respiratory failure. 1. Flaherty KR, Travis WD, Colby TV, Toews GB, Kazerooni EA, Gross BH, et al. Histopathologic variability in usual and nonspecific interstitial pneumonias. Am J Respir Crit Care Med 2001;164:1722-7. 2. Nicholson AG, Colby TV, Du Bois RM, Hansell DM, Wells AU. The prognostic significance of the histologic pattern of interstitial pneumonia in patients presenting with the clinical entity of cryptogenic fibrosing alveolitis. Am J Respir Crit Care Med 2000;162:2213-7. 3. Carrington CB, Gaensler EA, Coutu RE, FitzGerald MX, Gupta RG. Natural history and treated course of usual and desquamative interstitial pneumonia. N Engl J Med 1978;298:801-9. 4. Kondoh Y, Taniguchi H, Kawabata Y, Yokoi T, Suzuki K, Takagi K. Acute exacerbation in idiopathic pulmonary fibrosis. Analysis of clinical and pathologic findings in three cases. Chest 1993;103:1808-12. 5. Collard HR, Moore BB, Flaherty KR, Brown KK, Kaner RJ, King TE Jr, et al. Acute exacerbations of idiopathic pulmonary fibrosis. Am J Respir Crit Care Med 2007;176:636-43. 6. Mason DP, Brizzio ME, Alster JM, McNeill AM, Murthy SC, Budev MM, et al. Lung transplantation for idiopathic pulmonary fibrosis. Ann Thorac Surg 2007;84:1121-8. 7. Kim DS, Park JH, Park BK, Lee JS, Nicholson AG, Colby T. Acute exacerbation of idiopathic pulmonary fibrosis: Frequency and clinical features. Eur Respir J 2006;27:143-50. 8. Martinez FJ, Safrin S, Weycker D, Starko KM, Bradford WZ, King TE Jr, et al. The clinical course of patients with idiopathic pulmonary fibrosis. Ann Intern Med 2005;142:963-7. 9. Azuma A, Nukiwa T, Tsuboi E, Suga M, Abe S, Nakata K, et al. Double-blind, placebo-controlled trial of pirfenidone in patients with idiopathic pulmonary fibrosis. Am J Respir Crit Care Med 2005;171:1040-7. 10. Song JW, Hong SB, Lim CM, Koh Y, Kim DS. Acute exacerbation of idiopathic pulmonary fibrosis: Incidence, risk factors and outcome. Eur Respir J 2011;37:356-63. 11. Hiwatari N, Shimura S, Takishima T, Shirato K. Bronchoalveolar lavage as a possible cause of acute exacerbation in idiopathic pulmonary fibrosis patients. Tohoku J Exp Med 1994;174:379-86. 12. Honoré I, Nunes H, Groussard O, Kambouchner M, Chambellan A, Aubier M, et al. Acute respiratory failure after interferon-gamma therapy of end-stage pulmonary fibrosis. Am J Respir Crit Care Med 2003;167:953-7. 13. Kondoh Y, Taniguchi H, Kitaichi M, Yokoi T, Johkoh T, Oishi T, et al. Acute exacerbation of interstitial pneumonia following surgical lung biopsy. Respir Med 2006;100:1753-9. 14. Kondoh Y, Taniguchi H, Katsuta T, Kataoka K, Kimura T, Nishiyama O, et al. 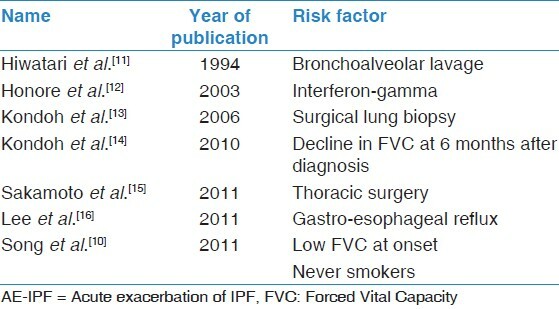 Risk factors of acute exacerbation of idiopathic pulmonary fibrosis. Sarcoidosis Vasc Diffuse Lung Dis 2010;27:103-10. 15. Sakamoto S, Homma S, Mun M, Fujii T, Kurosaki A, Yoshimura K. Acute exacerbation of idiopathic interstitial pneumonia following lung surgery in 3 of 68 consecutive patients: A retrospective study. Intern Med 2011;50:77-85. 16. Lee JS, Song JW, Wolters PJ, Elicker BM, King TE Jr, Kim DS, et al. Bronchoalveolar lavage pepsin in acute exacerbation of idiopathic pulmonary fibrosis. Eur Respir J 2012;39:352-8. 17. Stern JB, Mal H, Groussard O, Brugière O, Marceau A, Jebrak G, et al. Prognosis of patients with advanced idiopathic pulmonary fibrosis requiring mechanical ventilation for acute respiratory failure. Chest 2001;120:213-9. 18. Al-Hameed FM, Sharma S. Outcome of patients admitted to the intensive care unit for acute exacerbation of idiopathic pulmonary fibrosis. Can Respir J 2004;11:117-22. 19. Fernández-Pérez ER, Yilmaz M, Jenad H, Daniels CE, Ryu JH, Hubmayr RD, et al. Ventilator settings and outcome of respiratory failure in chronic interstitial lung disease. Chest 2008;133:1113-9. 20. Mollica C, Paone G, Conti V, Ceccarelli D, Schmid G, Mattia P, et al. Mechanical ventilation in patients with end-stage idiopathic pulmonary fibrosis. Respiration 2010;79:209-15. 21. Okamoto T, Ichiyasu H, Ichikado K, Muranaka H, Sato K, Okamoto S, et al. Clinical analysis of the acute exacerbation in patients with idiopathic pulmonary fibrosis. Nihon Kokyuki Gakkai Zasshi 2006;44:359-67. 22. Noth I, Martinez FJ. Recent advances in idiopathic pulmonary fibrosis. Chest 2007;132:637-50. 23. Azuma A, Nukiwa T, Tsuboi E, Suga M, Abe S, Nakata K, et al. Double-blind, placebo-controlled trial of pirfenidone in patients with idiopathic pulmonary fibrosis. Am J Respir Crit Care Med 2005;171:1040-7. 24. Yüksel M, Ozyurtkan MO, Bostanci K, Ahiskali R, Kodalli N. Acute exacerbation of interstitial fibrosis after pulmonary resection. Ann Thorac Surg 2006;82:336-8. 25. Sakamoto S, Homma S, Kawabata M, Kono T, Seki K, Nakata K, et al. Fatal acute exacerbation of idiopathic pulmonary fibrosis/ usual interstitial pneumonia initially in the right lung after surgery lobectomy for left lung cancer. Nihon Kokyuki Gakkai Zasshi 2004;42:760-6. 26. Koizumi K, Hirata T, Hirai K, Mikami I, Okada D, Yamagishi S, et al. Surgical treatment of lung cancer combined with interstitial pneumonia: The effect of surgical approach on postoperative acute exacerbation. Ann Thorac Cardiovasc Surg 2004;10:340-6. 27. Yokoyama A, Kohno N, Hamada H, Sakatani M, Ueda E, Kondo K, et al. Circulating KL-6 predicts the outcome of rapidly progressive idiopathic pulmonary fibrosis. Am J Respir Crit Care Med 1998;158:1680-4. 28. Kubo H, Nakayama K, Yanai M, Suzuki T, Yamaya M, Watanabe M, et al. Anticoagulant therapy for idiopathic pulmonary fibrosis. Chest 2005;128:1475-82. 29. Fernández-Pérez ER, Yilmaz M, Jenad H, Daniels CE, Ryu JH, Hubmayr RD, et al. Ventilator settings and outcome of respiratory failure in chronic interstitial lung disease. Chest 2008;133:1113-9. 30. Akira M, Kozuka T, Yamamoto S, Sakatani M. Computed tomography findings in acute exacerbation of idiopathic pulmonary fibrosis. Am J Respir Crit Care Med 2008;178:372-8. 31. Moeller A, Gilpin SE, Ask K, Cox G, Cook D, Gauldie J, et al. Circulating fibrocytes are an indicator of poor prognosis in idiopathic pulmonary fibrosis. Am J Respir Crit Care Med 2009;179:588-94. 32. Fujimoto K, Taniguchi H, Johkoh T, Kondoh Y, Ichikado K, Sumikawa H, et al. Acute exacerbation of idiopathic pulmonary fibrosis: High-resolution CT scores predict mortality. Eur Radiol 2012;22:83-92. 33. Judge EP, Fabre A, Adamali HI, Egan JJ. Acute exacerbations and pulmonary hypertension in advanced idiopathic pulmonary fibrosis. Eur Respir J 2012;40:93-100. 34. Egan JJ, Stewart JP, Hasleton PS, Arrand JR, Carroll KB, Woodcock AA. Epstein-Barr virus replication within pulmonary epithelial cells in cryptogenic fibrosing alveolitis. Thora×1995;50:1234-9. 35. McMillan TR, Moore BB, Weinberg JB, Vannella KM, Fields WB, Christensen PJ, et al. Exacerbation of established pulmonary fibrosis in a murine model by gamma herpes virus. Am J Respir Crit Care Med 2008;177:771-80. 36. Wootton SC, Kim DS, Kondoh Y, Chen E, Lee JS, Song JW, et al. Viral infection in acute exacerbation of idiopathic pulmonary fibrosis. Am J Respir Crit Care Med 2011;183:1698-702. 37. Huie TJ, Olson AL, Cosgrove GP, Janssen WJ, Lara AR, Lynch DA, et al. A detailed evaluation of acute respiratory decline in patients with fibrotic lung disease: Aetiology and outcomes. Respirology 2010;15:909-17. 38. Konishi K, Gibson KF, Lindell KO, Richards TJ, Zhang Y, Dhir R, et al. Gene expression profiles of acute exacerbations of idiopathic pulmonary fibrosis. Am J Respir Crit Care Med 2009;180:167-75. 39. Collard HR, Calfee CS, Wolters PJ, Song JW, Hong SB, Brady S, et al. Plasma biomarker profiles in acute exacerbation of idiopathic pulmonary fibrosis. Am J Physiol Lung Cell Mol Physiol 2010;299:L3-7. 40. Ambrosini V, Cancellieri A, Chilosi M, Zompatori M, Trisolini R, Saragoni L, et al. Acute exacerbation of idiopathic pulmonary fibrosis: Report of a series. Eur Respir J 2003;22:821-6. 41. Bonaccorsi A, Cancellieri A, Chilosi M, Trisolini R, Boaron M, Crimi N, et al. Acute interstitial pneumonia: Report of a series. Eur Respir J 2003;21:187-91. 42. Tajima S, Oshikawa K, Tominaga S, Sugiyama Y. The increase in serum soluble ST2 protein upon acute exacerbation of idiopathic pulmonary fibrosis. Chest 2003;124:1206-14. 43. Kurosu K, Takiguchi Y, Okada O, Yumoto N, Sakao S, Tada Y, et al. Identification of annexin 1 as a novel autoantigen in acute exacerbation of idiopathic pulmonary fibrosis. J Immunol 2008;181:756-67. 44. Papiris SA, Manali ED, Kolilekas L, Kagouridis K, Triantafillidou C, Tsangaris I, et al. Clinical review: Idiopathic pulmonary fibrosis acute exacerbations - Unravelling Ariadne's thread. Crit Care 2010;14:246. 45. Silva CI, Müller NL, Fujimoto K, Kato S, Ichikado K, Taniguchi H, et al. Acute exacerbation of chronic interstitial pneumonia: High-resolution computed tomography and pathologic findings. J Thorac Imaging 2007;22:221-9. 46. Swigris JJ, Brown KK. Acute interstitial pneumonia and acute exacerbations of idiopathic pulmonary fibrosis. Semin Respir Crit Care Med 2006;27:659-67. 47. Bradley B, Branley HM, Egan JJ, Greaves MS, Hansell DM, Harrison NK, et al. Interstitial lung disease guideline: The British Thoracic Society in collaboration with the Thoracic Society of Australia and New Zealand and the Irish Thoracic Society. Thora×2008;63:v1-58. 48. Parambil JG, Myers JL, Ryu JH. Histopathologic features and outcome of patients with acute exacerbation of idiopathic pulmonary fibrosis undergoing surgical lung biopsy. Chest 2005;128:3310-5. 49. Saydain G, Islam A, Afessa B, Ryu JH, Scott JP, Peters SG. Outcome of patients with idiopathic pulmonary fibrosis admitted to the intensive care unit. Am J Respir Crit Care Med 2002;166:839-42. 50. Wells AU. The clinical utility of bronchoalveolar lavage in diffuse parenchymal lung disease. Eur Respir Rev 2010;19:237-41. 51. Churg A, Müller NL, Silva CI, Wright JL. Acute exacerbation (acute lung injury of unknown cause) in UIP and other forms of fibrotic interstitial pneumonias. Am J Surg Pathol 2007;31:277-84. 52. Richeldi L, Davies HR, Ferrara G, Franco F. Corticosteroids for idiopathic pulmonary fibrosis. Cochrane Database Syst Rev 2003;3:CD002880. 53. Davies HR, Richeldi L, Walters EH. Immunomodulatory agents for idiopathic pulmonary fibrosis. Cochrane Database Syst Rev 2003;3:CD003134. 54. Rice AJ, Wells AU, Bouros D, Du Bois RM, Hansell DM, Polychronopoulos V, et al. Terminal diffuse alveolar damage in relation to interstitial pneumonias. An autopsy study. Am J Clin Pathol 2003;119:709-14. 55. Saydain G, Islam A, Afessa B, Ryu JH, Scott JP, Peters SG. Outcome of patients with idiopathic pulmonary fibrosis admitted to the intensive care unit. Am J Respir Crit Care Med 2002;166:839-42. 56. Steinberg KP, Hudson LD, Goodman RB, Hough CL, Lanken PN, Hyzy R, et al. Efficacy and safety of corticosteroids for persistent acute respiratory distress syndrome. N Engl J Med 2006;354:1671-84. 57. Meduri GU, Golden E, Freire AX, Taylor E, Zaman M, Carson SJ, et al. Methylprednisolone infusion in early severe ARDS: Results of a randomized controlled trial. Chest 2007;131:954-63. 58. Inase N, Sawada M, Ohtani Y, Miyake S, Isogai S, Sakashita H, et al. Cyclosporin A followed by the treatment of acute exacerbation of idiopathic pulmonary fibrosis with corticosteroid. Intern Med 2003;42:565-70. 59. Taniguchi H, Ebina M, Kondoh Y, Ogura T, Azuma A, Suga M, et al. Pirfenidone in idiopathic pulmonary fibrosis. Eur Respir J 2010;35:821-9. 60. Magro CM, Allen J, Pope-Harman A, Waldman WJ, Moh P, Rothrauff S, et al. The role of microvascular injury in the evolution of idiopathic pulmonary fibrosis. Am J Clin Pathol 2003;119:556-67. 61. Bates JH, Davis GS, Majumdar A, Butnor KJ, Suki B. Linking parenchymal disease progression to changes in lung mechanical function by percolation. Am J Respir Crit Care Med 2007;176:617-23. 62. Ventilation with lower tidal volumes as compared with traditional tidal volumes for acute lung injury and the acute respiratory distress syndrome. The Acute Respiratory Distress Syndrome Network. N Engl J Med 2000;342:1301-8. 63. Patroniti N, Pesenti A. Low tidal volume, high respiratory rate and auto-PEEP: The importance of the basics. Crit Care 2003;7:105-6. 64. Nakos G, Tsangaris I, Kostanti E, Nathanail C, Lachana A, Koulouras V, et al. Effect of the prone position on patients with hydrostatic pulmonary edema compared with patients with acute respiratory distress syndrome and pulmonary fibrosis. Am J Respir Crit Care Med 2000;161:360-8. 65. Lewandowski K. Extracorporeal membrane oxygenation for severe acute respiratory failure. Crit Care 2000;4:156-68. 66. Peek GJ, Mugford M, Tiruvoipati R, Wilson A, Allen E, Thalanany MM, et al. Efficacy and economic assessment of conventional ventilatory support versus extracorporeal membrane oxygenation for severe adult respiratory failure (CESAR): A multicentre randomised controlled trial. 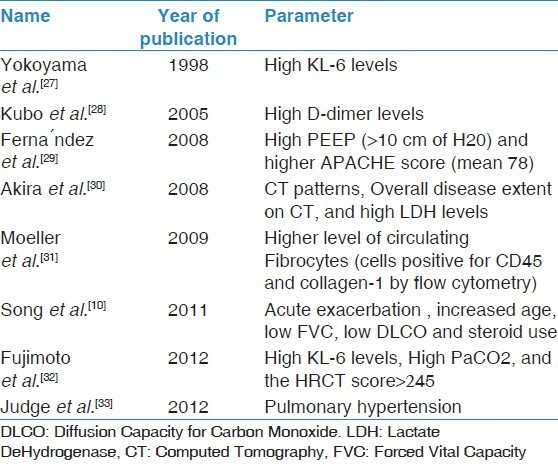 Lancet 2009;374:1351-63. 67. Zimmermann M, Bein T, Arlt M, Philipp A, Rupprecht L, Mueller T, et al. Pumpless extracorporeal interventional lung assist in patients with acute respiratory distress syndrome: A prospective pilot study. Crit Care 2009;13:R10. 68. Santambrogio L, Nosotti M, Palleschi A, Tosi D, Mendogni P, Lissoni A, et al. Use of venovenous extracorporeal membrane oxygenation as a bridge to urgent lung transplantation in a case of acute respiratory failure. Transplant Proc 2009;41:1345-6. 69. Orens JB, Estenne M, Arcasoy S, Conte JV, Corris P, Egan JJ, et al. International guidelines for the selection of lung transplant candidates: 2006 update - A consensus report from the Pulmonary Scientific Council of the International Society for Heart and Lung Transplantation. J Heart Lung Transplant 2006;25:745-55. Authors of Document Antoniou, K.M., Wells, A.U.